As consumers gain more awareness of the world around them, they also begin to care more about the negative perceptions surrounding the clothing industry. This has led to greater demand for a more environmentally friendly fashion industry that values human rights and limits environmental impacts. According to the Council for Textile Recycling, 85% of post-consumer textile waste, equivalent to about 70 pounds per American, makes its way to landfills each year. The statistics demonstrate the large impact the textile industry has on the environment. Many leaders and students in North Carolina’s Research Triangle community care about these environmental issues and want to address them. 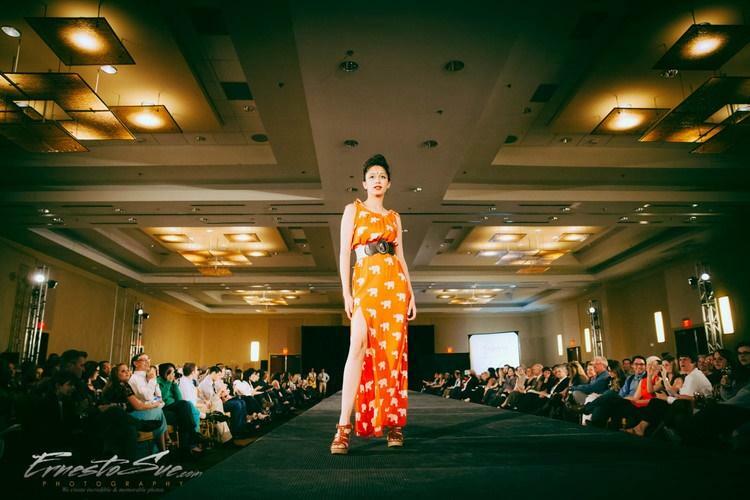 Each year, Redress Raleigh hosts a fashion show and invites eco-friendly fashion designers to raise more awareness and to support sustainable designers and companies. “One way we promote eco-friendly clothing and fashion is through the fashion show both by providing support to the designers participating in the show, as well as introducing the general public, buyers, and boutique owners to the idea of eco-friendly fashion” says Beth Stewart, strategic developer of Redress Raleigh. A model from last year’s Redress Raleigh fashion show wears a dress by Symbology. Symbology is a fair-trade brand who works with women artisans in India and the West Bank to create gorgeous hand-printed textiles. Courtesy of Beth Stewart. “The second aspect that we will be focusing on more this year are events that introduce more of the general public to the impacts of the fashion and textiles industry by talking about some of the environmental effects and human rights violations and what we can do to make better choices about what we buy,” says Stewart. The clothing industry has faced much criticism, starting in the 1980s and 1990s, for human rights violations. This led to a greater consumer focus on the effects of the apparel industry. Key players, such as Yvon Choiunard of Patagonia and fashion designer Eileen Fischer, have cemented the idea of an environmentally friendly fashion industry by using the environment as a platform for their businesses. Moving toward sustainability can be difficult for a fashion label, considering way our throw-away society cycles through clothing. “I think a lot of industries are caught in the fast fashion model and are not sure how to break out of it right now,” she says. The term fast fashion relates to the way companies expedite their manufacturing process to produce clothes quickly and sell apparel at cheaper prices. “I think we are still not understanding what it really means when we are buying a $10 pair of jeans,” says Stewart. Stewart cites additive manufacturing as an innovative technique that limits clothing waste. Most companies produce large quantities of clothing and have leftover inventory that ultimately makes its way to landfills as waste. In additive manufacturing, consumers request clothing first from companies, who then produce the materials. This process limits leftover waste, since companies only produce what customers request. 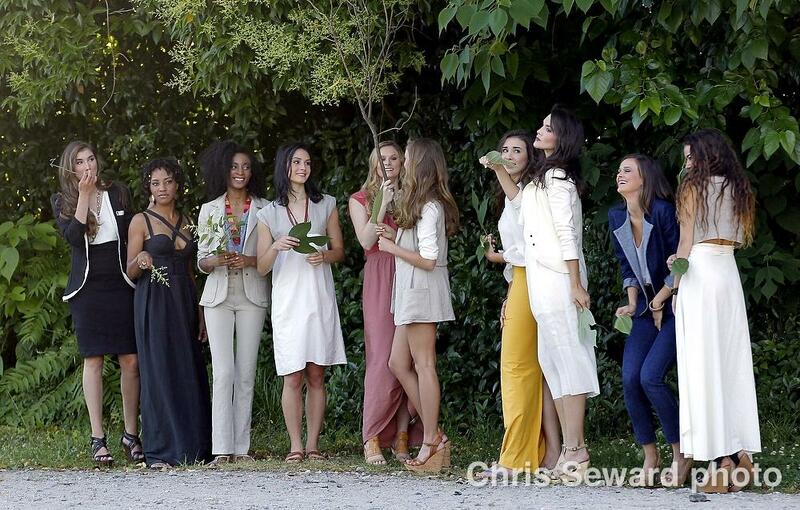 Models pose in clothes designed by Pretty Birdie Co., another company featured in the Redress Raleigh 2015 Fashion Show. This Greensboro-based brand produces high-end women’s and children’s clothing using predominantly hemp textiles. Courtesy of Beth Stewart. In the Triangle area, many local companies and boutiques have made it their mission to limit the environmental impacts of the clothing industry. One of these companies is Organicality, which produces sustainable and organic clothing for customers. “We work with designers and fabric suppliers to address a range of concerns so that my customers can match their values (to the products),” says Carrie Reuben, founder and president of Organicality. According to its website, Organicality uses a variety of environmentally friendly types of cotton, including organic cotton that meets Global Organic Textile standards, low-carbon cotton grown and processed within an 85 mile radius, and transitional cotton blends that mix recycled PET bottles with transitional cotton. The company also uses water-based inks and low-impact reactive dyes in its clothing. “I try to provide options so, for example, if someone is really concerned about organics that they find a selection of organic products. If someone is concerned that everything is US made or more concerned about being local or lowering their carbon footprint, we try to have everything addressed,” Reuben says. Reuben thinks companies need to address environmental impact because more customers care about the repercussions incurred by their clothes. This trend has become popular as a result of other movements, such as the “buy local foods” movement and local farm movements. The clothing industry has changed at a much slower rate, but changes are coming, especially for parents interested in buying organic products for their babies and children. “I’m finding it a stronger message for the younger markets—for mothers and fathers and aunts and uncles and grandparents—to see why they care for babies and small children,” said Reuben. Little Grey Line was among the many brands that were featured in Redress Raleigh’s 2014 fashion show. 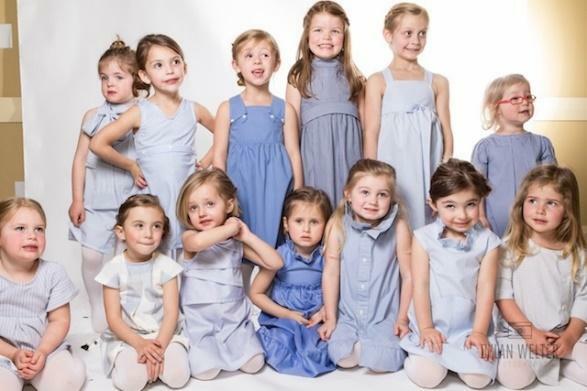 Little Grey Line upcycles men’s work shirts into cute little dresses for girls. Courtesy of Beth Stewart. Social media has also played a large role in raising awareness about the environmental practices of various companies while simultaneously spreading the word about human rights violations. As a result of social media and greater market pressure, many clothing companies have adopted environmentally friendly practices to reduce waste. For example Levi’s has adopted a water-less process that limits the amount of water it takes to produce some of its clothing products. According to levistrauss.com, this approach saved more than 1 billion gallons of water in 2011. “In many times, the most environmentally friendly way of doing something saves the company money, and so many companies have been making efforts because it is better for them as a business,” Reuben says. She hopes that the clothing industry will continue to adopt environmentally friendly practices because she wants to live in a world where she does not have to worry about the practices of a company but rather the fit and style of the clothing. 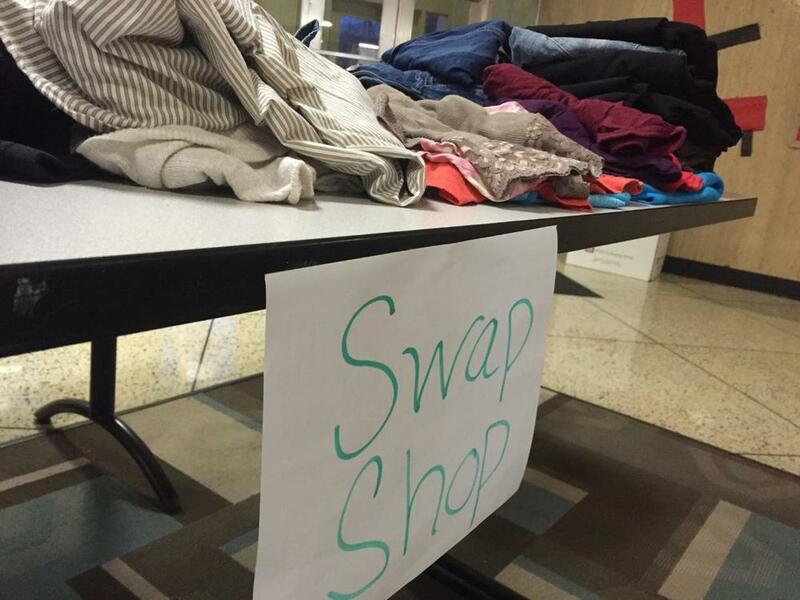 To reduce clothing waste, many students on campus have expanded the idea of “swap shops”, where students can buy donated and gently used clothing and similar items to help eliminate waste. Last year, the Office of Waste Reduction and Recycling hosted an America Recycles Day. Members of the Epsilon Eta Environmental Honor Fraternity collected clothes and gave them away for free at the event’s swap shop. A close-up image of some of the textile materials sold at the Craig Residence Hall “Swap Shop.” Courtesy of Kathia Toledo. 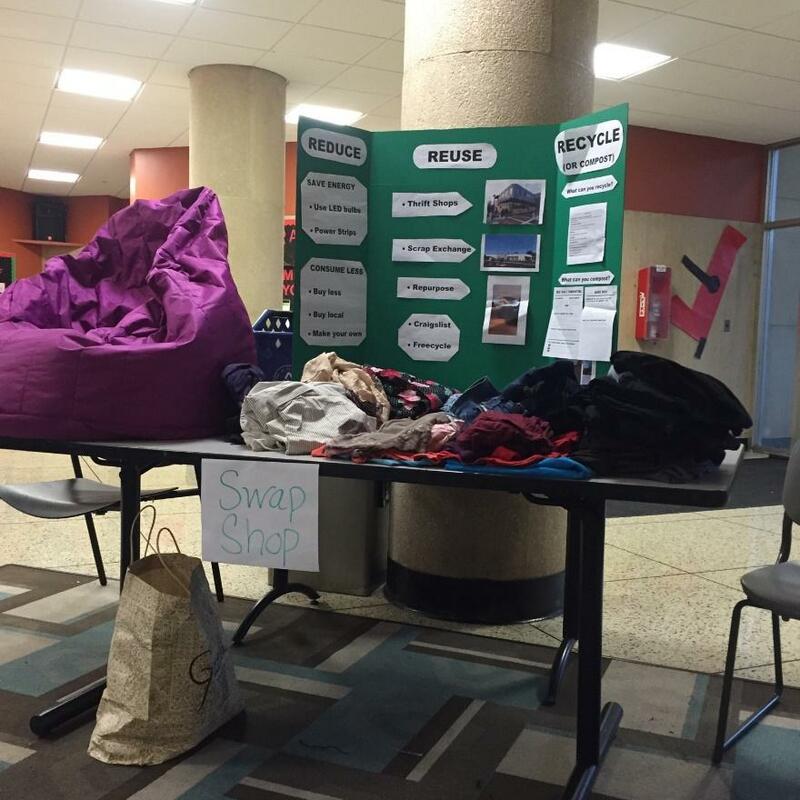 A table at the Craig Residence “Swap Shop” that explains why students should reduce, reuse, and recycle their clothing and other waste. Courtesy of Kathia Toledo. Toledo demonstrates how college students can take small steps to reduce their waste and create an environment that supports eco-fashion. “To support the clothing industry in becoming more environmentally friendly, I purchase some second-hand items, buy locally and sustainably made clothing when possible, and avoid excessive consumerism,” she says. Why has blackface made its way back into fashion?